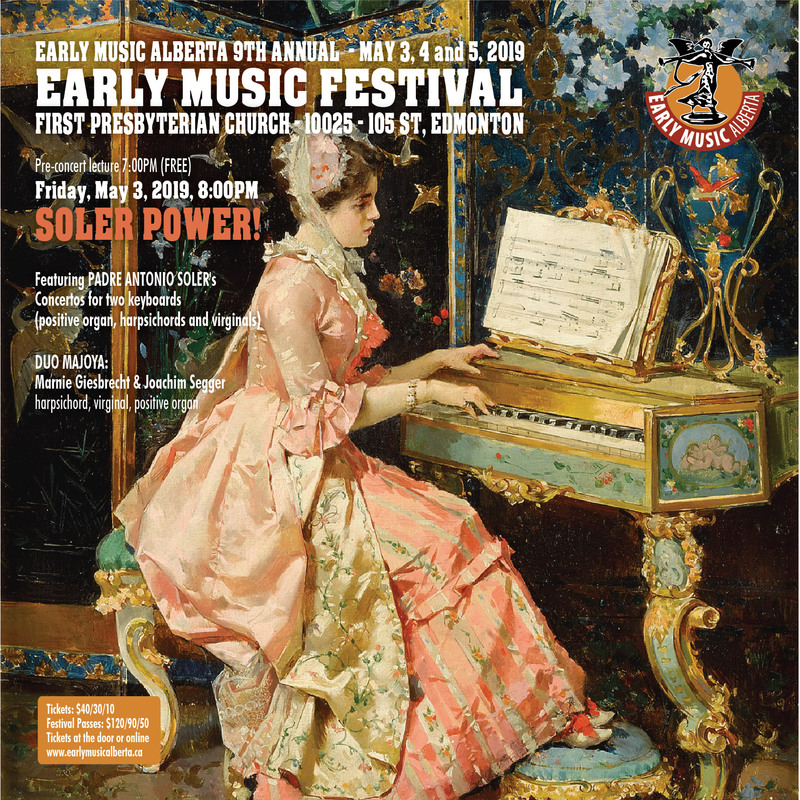 Early Music Alberta is proud to present a fantastic line-up of stellar musicians and a festival full of widely varied programs for our 9th annual early music festival, which will be taking place on May 3, 4 and 5, 2019. The wonderful, historic First Presbyterian Church will be our home for the festival again. With four spectacular feature concerts, we offer more performances than ever this year, including (free) pre-concert talks to get you informed and in the mood. 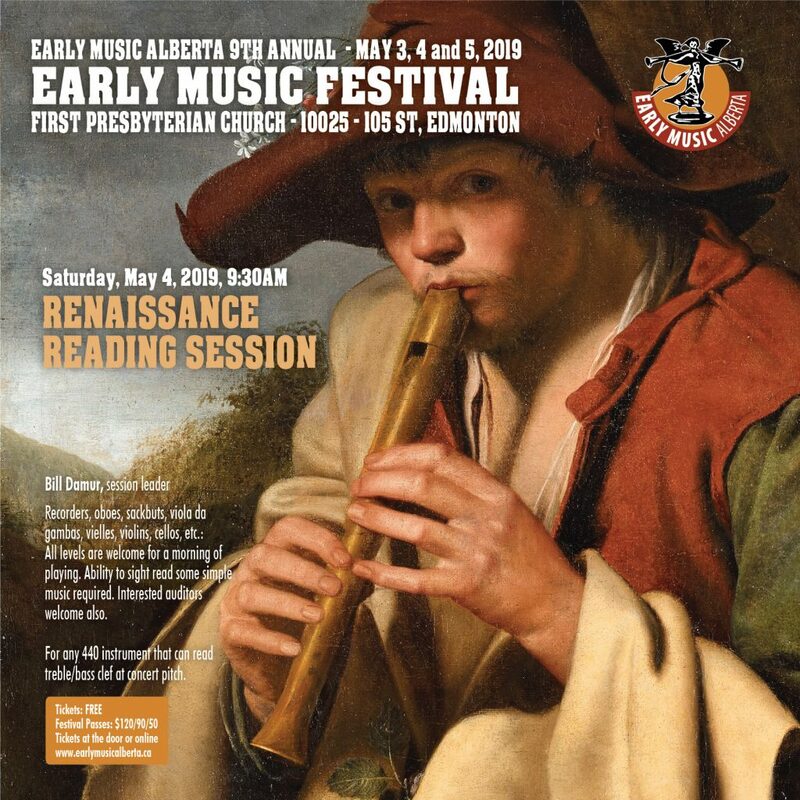 We present a wonderful concert featuring four community early music ensembles, and our two free events are the annual renaissance reading session and, new this year, a baroque dance workshop. Individual concert tickets and festival passes are below or at the door. Featuring the Seis Conciertos de dos Organos Obligados Compuestos (Six Concertos for Two Keyboards) of Antonio Soler (1729-1783). Music that is sunshine for the soul, and will brighten moods and lift spirits, the six double keyboard concertos by Padre Antonio Soler are some of the most sumptuous, irresistible music one can hear or imagine. The slow movements are tuneful and gorgeous, lyrical and contemplative. The faster movements are toe-tapping and quill-plucking dance-inspired music of the Catalonian late Baroque and early Classical styles. 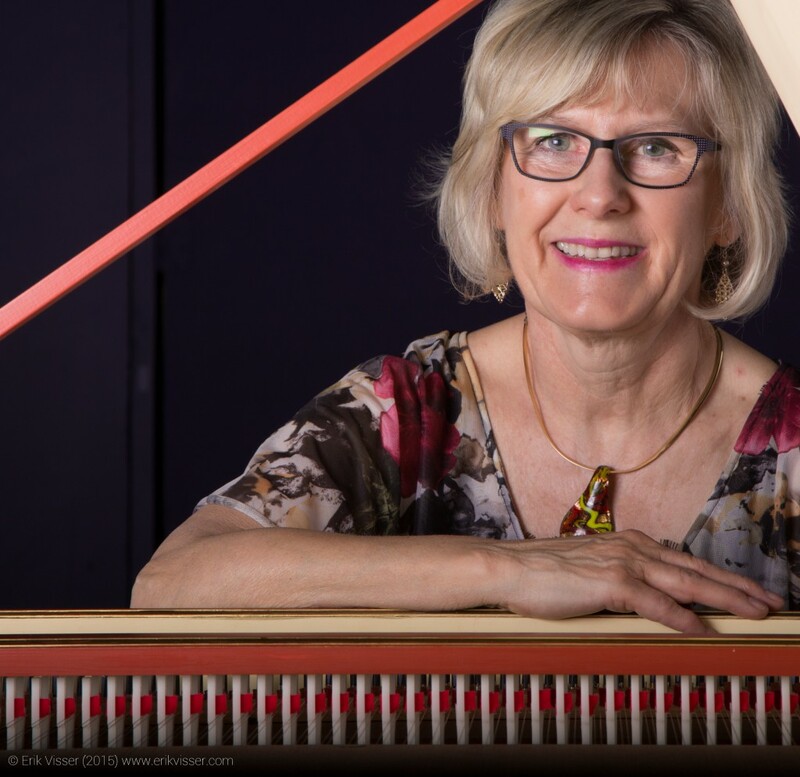 Often recorded on two like instruments, this Edmonton premiere performance of the Six Concertos will be performed on a calliope of colourful keyboard instruments: virginals, harpsichords and positive organs. Dueling keyboards may have originated with these concertos, and Duo Majoya will spar, cajole, harmonize and woo each other and the audience with this fascinating music. 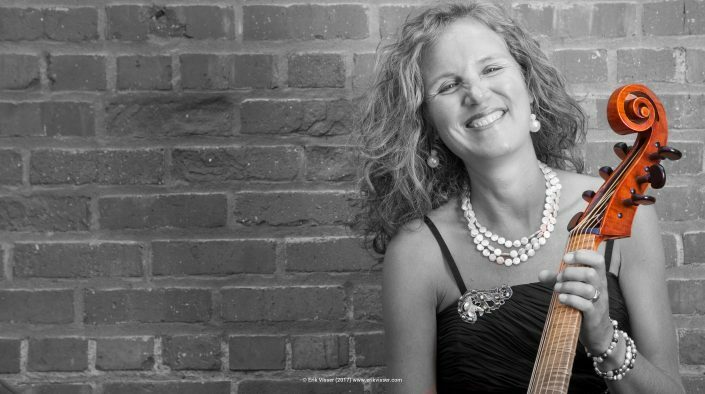 Instrumentalists of all ages and abilities can join these two hours of music making. Recorders, oboes, sackbuts, viola da gambas, vielles, violins, cellos, etc. : All levels are welcome for a morning of playing. Ability to sight read some simple music required. For any 440 instrument that can read treble or bass clef at concert pitch. Try out baroque court dance. You’ve seen pictures of dancers. You’ve heard the music. Now combine the two and experience French court dance as they would have done it. Indulge in the lush sound of two cellos with baroque cello superstar Elinor Frey from Montreal and Early Music Alberta’s own Josephine van Lier. 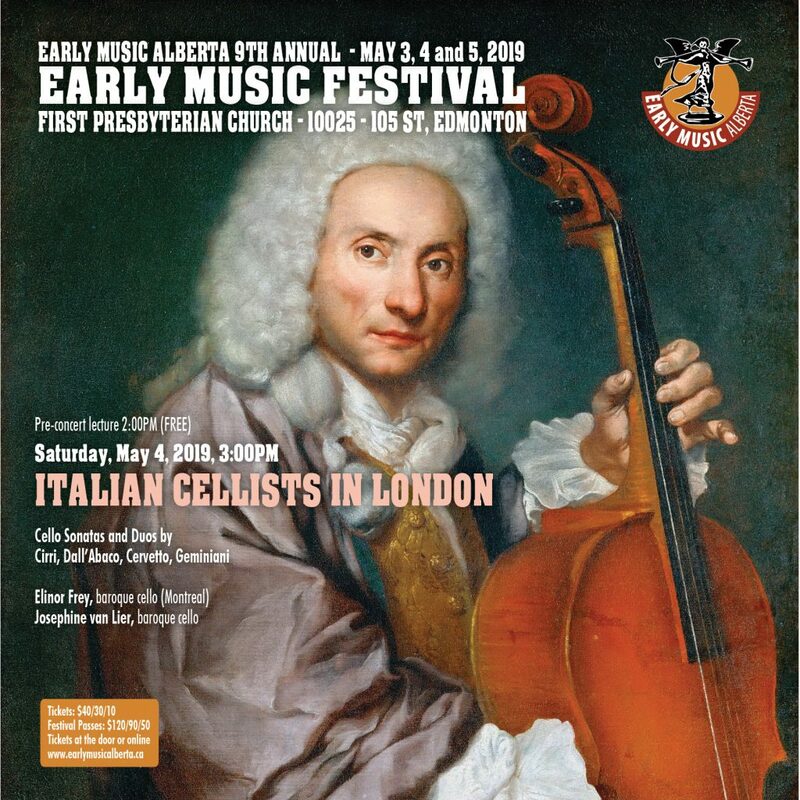 They will perform cello duos and sonatas by 17th and 18th century Italian cellists/composers who worked in London and who were instrumental in establishing the cello as a solo instrument. 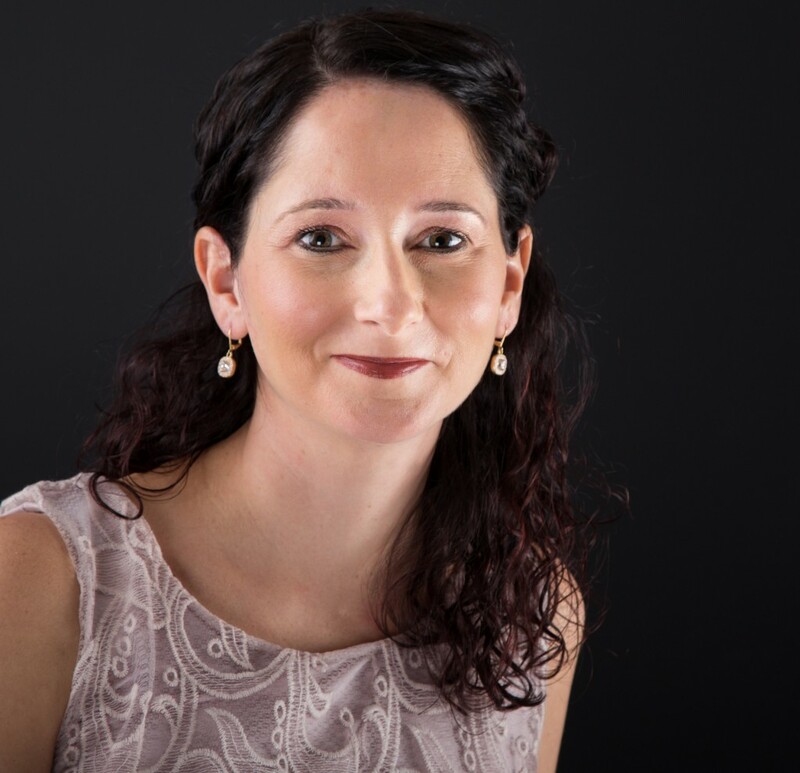 Several of the works were recently discovered and subsequently published by Elinor. The audience is in for a treat: some of these pieces have not been performed in many centuries! A concert not soon to be forgotten. 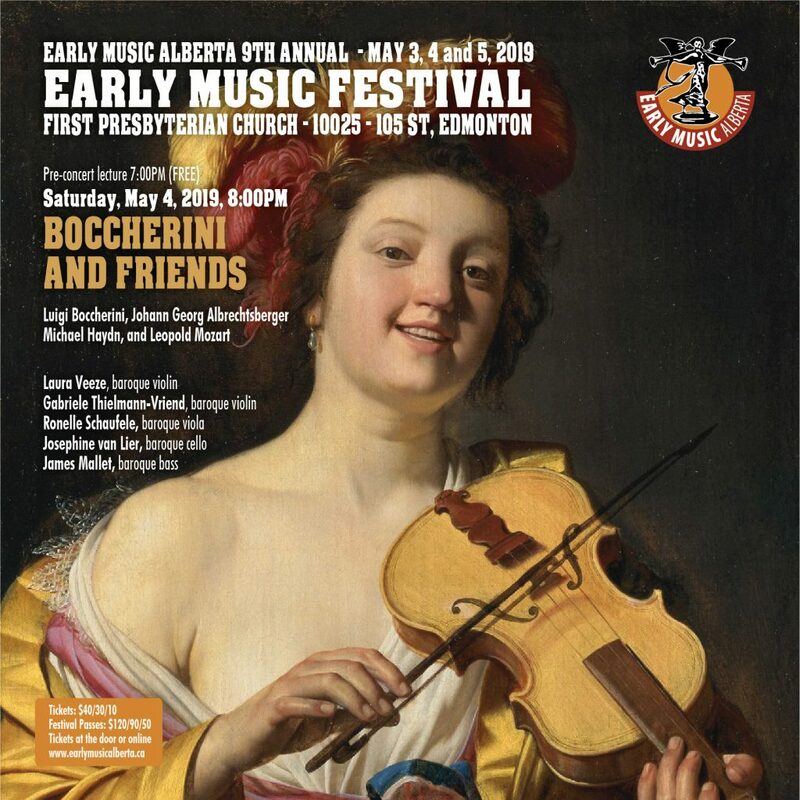 “If God wanted to speak to men through music, He would do it with the works of Haydn, but if He wanted to listen to music, He would choose Boccherini.” Patron saint of musicians St. Cecilia sings her heart out to heaven above with this program of quintets by Boccherini, scored for a team of local Alberta musicians. 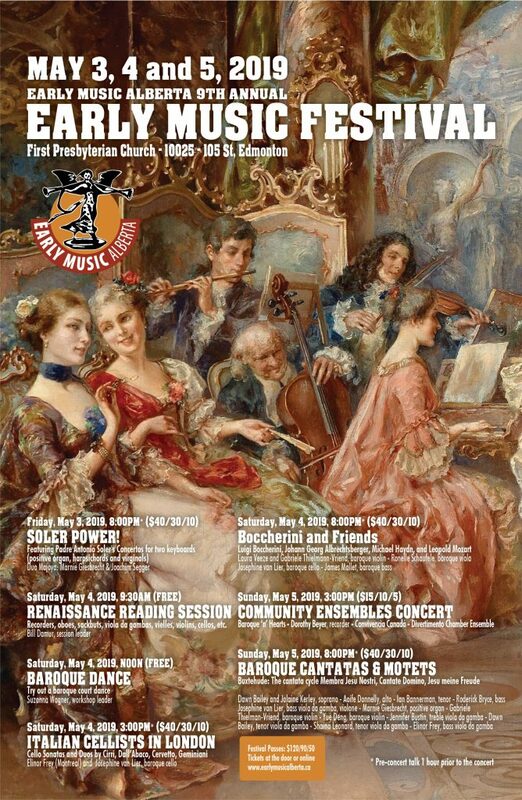 This concert includes the three quintets that Boccherini wrote in 1787 for a patroness in Berlin. Unusual is the prominent role the double bass plays in these very attractive works! In addition to these quintets, the performance will also feature 3 trios – one for violin, cello and bass by Leopold Mozart, and two for viola, cello and bass by Michael Haydn and Johann Georg Albrechtsberger, all contemporaries of Boccherini. These spectacular works are virtually unknown and will be sure to surprise and delight the audience. Edmonton has a rich community of ensembles working on early music. Some play on historic instruments and set-ups, while others enjoy the endless choice of repertoire on modern instruments. 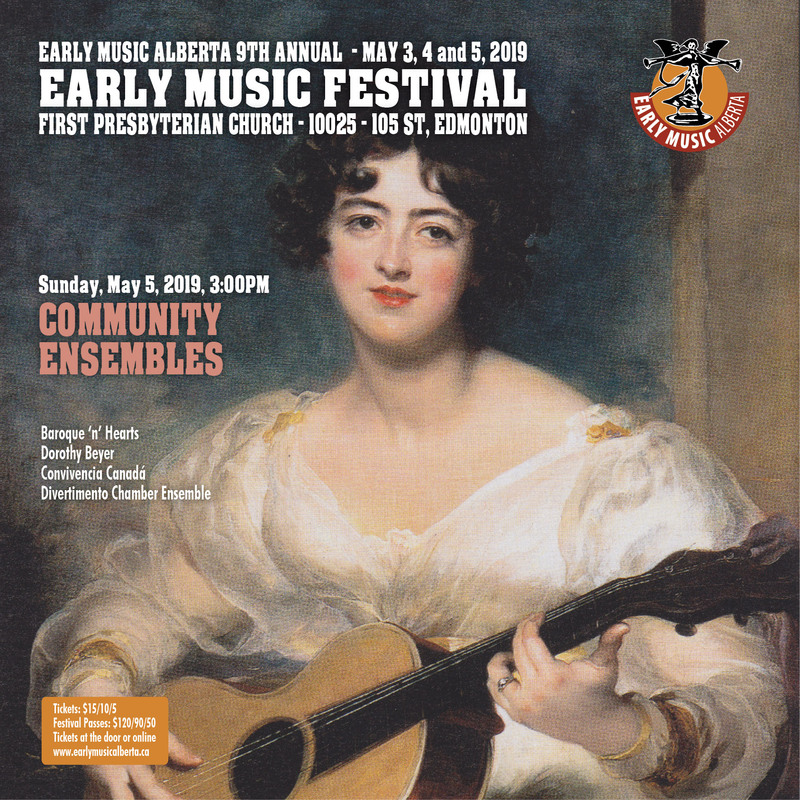 Early Music Alberta is excited to provide a performance platform for these adult amateur musicians and aspiring music students who dedicate their time to playing and interpreting early music. 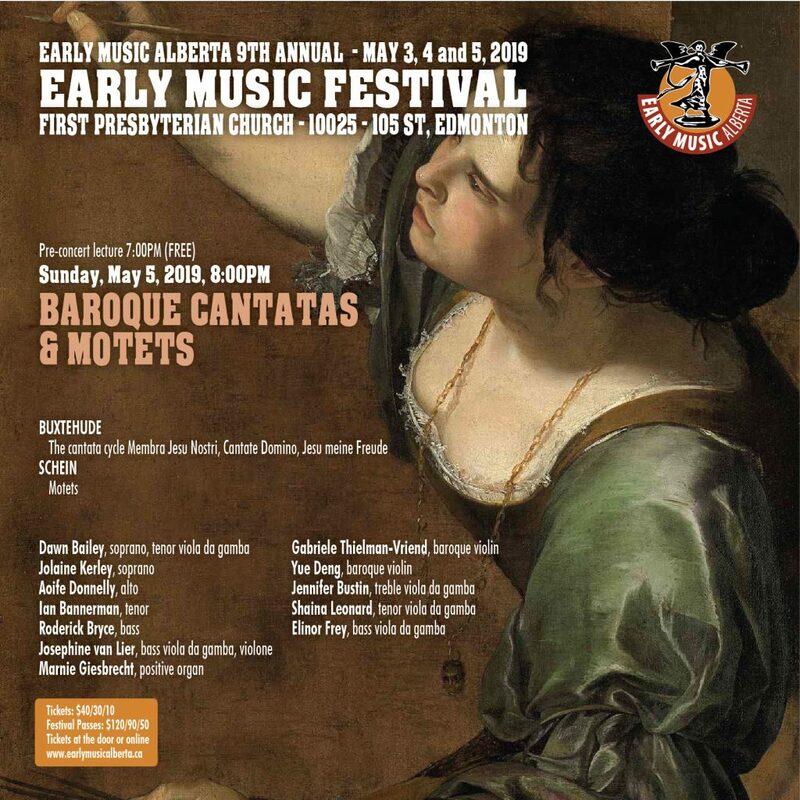 This concert features one of the greatest masterworks of 17th-century music: Dieterich Buxtehude’s Membra Jesu Nostri, an intense and expressive cycle of cantatas on the wounds of Christ, combining vivid texts with intensely expressive music. At the heart of the cycle of cantatas is the most tender and intimate “Ad cor”. Here, Buxtehude requests a dramatic instrumentation change to the delicate, shimmering timbre of an ensemble of five viols. Also on the program are several Motets y Schein and Buxtehude. There will also be masterclasses by some of Canada’s finest period performers. This promises to be a very special evening full of exquisite music for any combination of voice (bass), violin, cello and harpsichord. 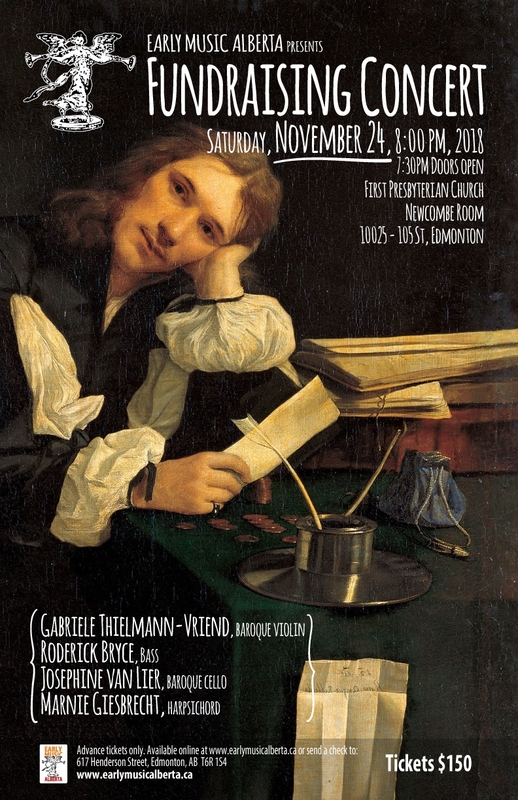 There will be music by Clerembeault, Handel, Schobert, some never before heard English baroque music, and much more. 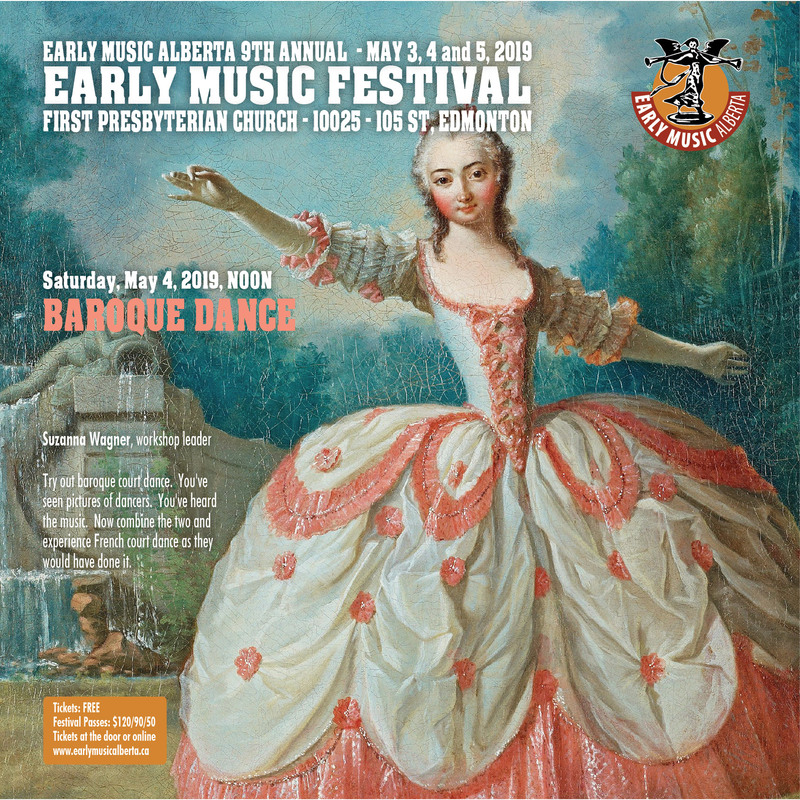 This program of French baroque music from the court of Louis XIV features Edmonton soprano Jolaine Kerley and Calgary based soprano Katie Partridge, with Josephine van Lier on viola da gamba and violone and Marnie Giesbrecht on harpsichord. Unlike most of his contemporaries, who wrote grand pieces for large forces, François Couperin preferred to pen compositions for one or two solo voices and continuo. Out of an apparently complete set of Tenebrae lessons drawn from the Lamentations of Jeremiah the Prophet, only three have survived, and they are presented on this concert along with a Magnificat, scored for two sopranos and continuo. 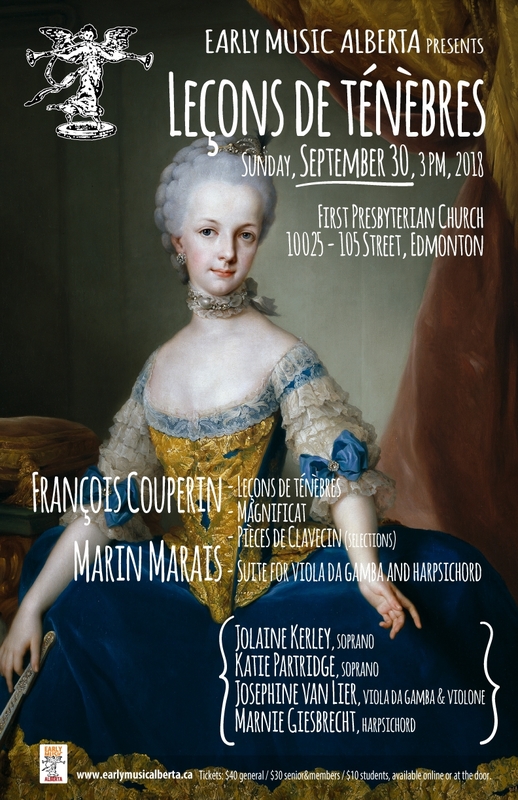 Also on the program are Couperin’s Pièces de Clavecin and a suite for viola da gamba and continuo by Marin Marais. Both Couperin and Marais worked at the court of Louis XIV. Rarely performed, the music on this program is very expressive and exposed and the musicians must make the music sound like simplicity itself.